Sometimes people just astound me. First of all, I was very disappointed to find that Mike Brooks, one of my DC buddies, has been “disinvited” from the Infoshop. Translated, “disinvited” basically means “banned”. I was quite disappointed by that, and I considered that a major loss-of-cool-points for the Infoshop. The other oddball thing at the Infoshop, which is in on the whole anti-Starbucks thing, was what I found on a shelf tucked away in the corner: Two packets of Starbucks Decaf. Seeing that, I held it up to show the attendant at the desk, and said mock-disapprovingly, “What is this?” The attendant didn’t have an answer for that one. Meanwhile, I’m sure that Sis, who, on A16, left a demonstration to go to Starbucks, is going to really get a huge kick out of my Infoshop find. Otherwise, I found quick food near Old Town in Alexandria. There’s a Whole Foods Market behind the Old Town Transit Shop, and it’s got a hot bar and a salad bar like Martin’s in Waynesboro. Notice I didn’t say “cheap food”, though. I said “quick food”. The reason is that Whole Foods is pretty darn pricey. Martin’s, which I consider expensive, looks dirt cheap when compared to Whole Foods. First of all, hello from Washington, where I am doing a second black-and-white day. Depending on how things come out, you may see a photo set in Photography about this, where I took photographs around Washington Circle. Now, for my good deed. I’d just gotten off of an Orange Line train (CAF 5157) at Rosslyn. A Breda train arrived on the lower level. I’m intrigued, curious to see if it had the new door chimes or not (it didn’t). Then I heard a woman yelling and pounding on the train as it took off. Part of her party had become separated when the operator closed the train’s doors. The lady was on the verge of hysterics. While others were communicating with her from the upper level, I got on the escalator and went down to see what I could do. I told her to call Metro Transit Police. As a railfan, I have the phone number for Transit Police in my phone’s address book, just in case. So I pulled it up, placed the call, and passed the lady the phone. Gave my scooter to Goodwill, and it’s kind of heartening to know that the system does still work. First of all, remember this? 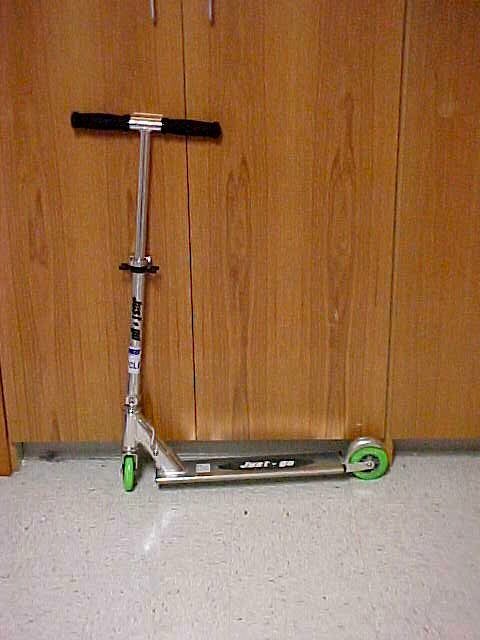 That’s my “Just Go” scooter, which is basically a knock-off of the Razor scooter. 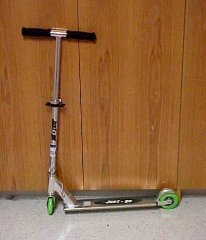 It is actually better described as my former scooter, as I donated it to Goodwill last Thursday. I figured, since I’d not ridden it in nearly five years (seriously! ), I might as well get rid of it, so someone else can get some good use out of it. Thus I gave it to Goodwill. I got called “babe” today, by a man, in front of his wife! Of all the stupid things people can say, the thing that a man in my line said today definitely took the cake. First of all, for those of you who have seen pictures of me (and if you’re here at my site, it’s pretty hard not to), you can tell I’m obviously male. I paused, so as to take a moment to digest this comment, which I was not expecting. Then I said, “Did you just call me ‘babe’?” He explained it away by saying that he was thinking about the cashier before me on that register (we’d just switched out just before I started ringing him up). Still, I wonder if he wanted a little salt with that foot, considering he said that right in front of his wife, of all people. That just took the cake, let me tell you. Today at work was the first real test of my will after having given up red meat (as a stepping stone towards vegetarianism) at the beginning of this month. How was this different from otherwise? Two words: free food. Work had a cookout for all the associates today. Considering I’m working on paying off a Mercury Sable, I’m usually not one to pass up a meal that someone else is paying for. And what did I do? Scary to think about it, but it’s true – it’s been ten years since I first created The Schumin Web. And now I’ve got the site all decorated up for the tenth anniversary. The photo feature is a collage of old site designs, and the URL beneath the logo at the top of all the pages has been replaced with the phrase “Celebraring ten years online”. I still remember the day that I first created this site way back in 1996. Of course, we didn’t call it “The Schumin Web” back then. Back then, I called it “Ben Schumin’s Home on the Internet”. That then changed to “Ben Schumin’s Internet Command Center” (I was big into Power Rangers in 1996). That then changed to “The Great American Road of Ben Schumin” and then to “The User-Friendly World of Ben Schumin”. That last one’s being such a hideous name, by the way, gave rise to the current “Schumin Web” name in late 1998, which ended up sticking. Still, that first day was something. I was playing around with NaviPress, which was a WYSIWYG Web page designer – a good thing, since I’m more of a visual designer than a coder. I was playing around on there at our old computer down in the living room, trying to figure out how to make the program work, and I actually got something to work. I ended up uploading it to AOL’s “My Place” where you had a little Web space. Then the next step was showing it off. I was so proud of my little URL, which was http://members.aol.com/BenSchumin/. Nowadays, I would be embarrassed to have such a URL, but this was the mid-90s, and the Web was still young. Spring is a matter of a few days away, and I figure I might as well clean something. The junk I’ve collected since last I cleaned is starting to choke out the floor space, so something needs to be done. My goal is to reclaim some space so I can empty out a storage unit that we’re renting that contains stuff for a future DC-area apartment that I’m long overdue in getting due to my inability to secure a job up there. So all in all, it’s time to eliminate some fluff. I’ve got this dark corner in my room behind the recliner that I could use to hold stuff, plus the closet is still mostly empty from last year’s cleaning-out. Still, it ought to be fun. I went railfanning in DC with my friend Matthew Tilley on Wednesday, and I have to say… I was right on the money with one thing that happened early on in our trip. We were waiting on the upper level platform at Rosslyn, and had just passed up an Orange Line train into DC as “too crowded”, hoping to catch the next train, which we had hoped would be less crowded. So there’s this Blue Line train that looks like it’s coming through the C Route tunnel towards Rosslyn. And it’s still back there. Then the headlights go off on the front of the train, and the taillights come on. This is repeated a few times. I told Matthew that it seems that our Blue Line train was experiencing problems in the tunnel. Ever get that feeling like you forgot something? Somehow, I’m getting that feeling when went to top off the camera batteries for today’s DC trip when the batteries took a lot longer to charge than usual. I get this feeling that I never charged them from the last trip to DC I took on the 28th. This is not a “fatal” error, though. I’ve charged the camera’s batteries en route before using a power inverter, most notably on June 23, 2004, where I ran the batteries dry the day before in Charlottesville, and then fell asleep that evening without charging anything. Then I got up in the morning, realized, oh, crap! and went to work charging them, and ended up taking my charger with me to Washington. That’s also the reason I have the power inverter in the first place. I bought it to charge with on that trip. Thankfully, Washington was far enough away so that by the time I got there, I’d had a chance to charge everything to full power. And I was going railfanning that day with Oren and Jersey Mike, so I needed a full charge, too. Of course, that’s similar to this trip, where I’m going railfanning with Matthew Tilley. There are some DC trips that just happen, and then there are some that I really am excited about. As is my usual case about every two weeks, I am going to Washington on Wednesday. This time around, I’m going to meet up with my friend Matthew Tilley. I’ve met up with Matthew twice before. We went railfanning one time in October, then I surprised him in December. Now we’re going on Wednesday to do a tour of the Red Line. We’re starting at Metro Center, going out to one end, then bus to the other end, and then back down to Metro Center. Ta-da! One Red Line! And I am honestly excited. We had a lot of fun on our last railfan trip, when we did a tour of the Blue, Orange, and Yellow Lines. This one ought to be just as exciting. Lee High in Staunton lost their state championship, and it serves them right. I read today in the Staunton News Leader about the whole to-do about Lee High losing the state boys’ basketball championship, after having won it the past two years. Many people were hoping for a “three-peat” of the state championship, which was against Martinsville, and played at VCU in Richmond. Schools in Staunton were even dismissed early on Friday, to facilitate those traveling to Richmond to see the semifinals. Elementary schools in Staunton closed at 11:50 AM, Shelburne Middle School at 11:00 AM, and Lee High at 11:25. Lee got to the final championship game, and they lost. And I have to say, it serves them right. And it serves them right because the school district took the bold step of officially putting athletics ahead of academics. Of course, realize that academics are what the whole purpose is of having a school system and such in the first place. But instead silly games get the spotlight. And my experience in high school was that athletics really were king, but they just never said so. And they certainly never cancelled school. It just really bothers me for schools to be dismissed early for an athletic event. Especially with all the big to-do with high stakes testing related to Virginia’s “Standards of Learning” program and the federal “No Child Left Behind” program. Especially since, by having school and serving lunch, the day is considered “official”, even though school only lasted three hours and change. That’s barely even worth showing up for, and a waste of a day, if you ask me. If they’d cancelled school outright, then they would have to make the day up (I don’t know if Staunton had any built in snow days or not). That would be less offensive to me, because of the need to make the time up. All in all, I think that the early dismissal jinxed them. Serves them right. At long last, I found my cell phone charger. I found my charger in the suitcase that I used in my vacation to Virginia Beach back in August. And it only took me more than six months to find it. This after I practically turned the house upside down on a few occasions looking for it. And it’s funny how I found it, too. 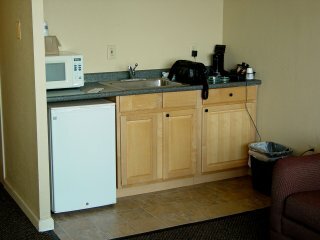 I was working on the photo set from that Virginia Beach vacation (which you’ll hopefully see soon now that work has begun on it in earnest), and I was looking at a photo of the kitchenette in my suite at the Travelodge in Virginia Beach. You would think, since I’ve driven a van for most of the time I’ve been driving, that I’d be used to a car that rides high. Especially since it’s not even been a month since I turned in the Previa for the Sable (I got the Sable on February 9). So yeah, I had to drive Mom’s Sienna today. That was a culture shock, mainly because I felt like I was very high up off the ground. In the 27 days (so far) of driving the Sable, I have gotten used to feeling like I’m sitting flat on the pavement. In the Sable, one rides low to the ground, like in most cars. Still, I felt really high up in the Sienna. I also am amazed how quickly I forgot where all the controls are. I reached for the selector in the center console like I do on the Sable. The Sienna, by the way, has controls like the Previa had, and so the selector’s on the steering column. I’m reaching for the left stick on the column for the wipers. They’re on the right in the Sienna. All in all, it was a strange feeling. And I’m still surprised about how accustomed I am to driving at car height. How interesting, though, that on the anniversary of the operation, I went to Washington. And went ice skating. Meanwhile, I’ve gotten comments from three different people that I look like I’ve lost weight. One was Mom, and two were coworkers. So these are people who see me all the time and have noticed these things. It’s gotten me thinking. I’ve been heavy for most of my life, but I like to think I’ve always carried it fairly well. 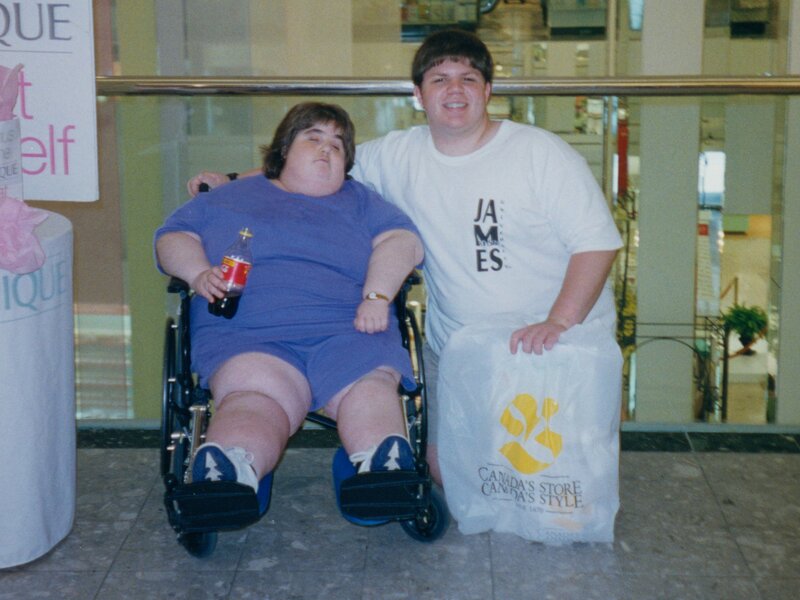 Still, if one modifies one’s eating habits, who knows how far we can go. Now before you think crash diets or anything like that, let me say this. For some time now, I’ve admired vegetarians. These are the people who have managed to eliminate meat from their diets. Meat, particularly red meat, is kind of fatty, and not exactly the most healthy thing on earth. I’ve contemplated making a changeover to vegetarianism, but I’ve also realized that if I were to make a change all at once, I’d break it the next day. Too radical. Too much at once. Bowever, lately, in thinking about this, I’ve been wondering how difficult it would be if I worked out certain classes of meat one at a time, while exploring around a bit food-wise. I’m thinking it just might work. I’m still contemplating it, though.